There are some 20,000 business jets in the world; it’s safe to say that not all of them are this colourful. 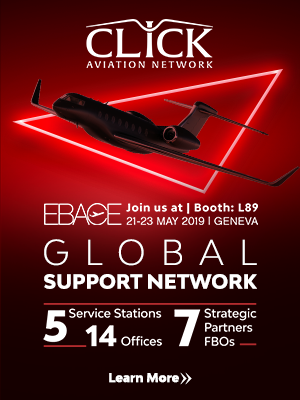 Anonymity is one of the key drivers in business aviation. To be able to get to your destination unseen and slip out quietly and unnoticed when you arrive means that it’s almost impossible for anybody to track your movements. 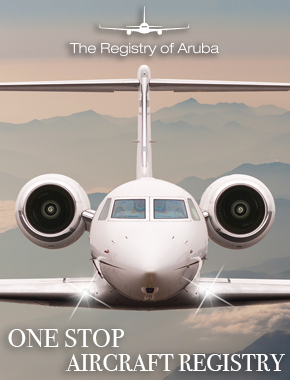 Hiding your aircraft on an offshore registry, placing your aircraft in trust or blocking the aircraft registration from online flight tracking makes it harder to identify who owns the aircraft and to trace where it’s travelled to. But once it arrives at its destination, the aircraft is in plain sight for everybody to see. 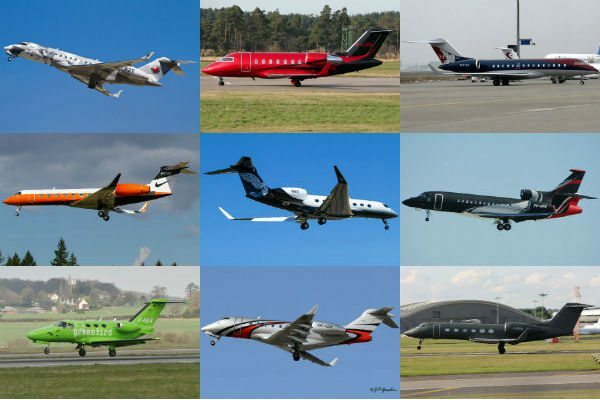 This is why the vast majority of business jet colour schemes can be described as boring at best (after all, if you can’t identify who owns an aircraft, there’s little hope of knowing who’s likely to be on board). But some companies and individuals like to buck this trend. 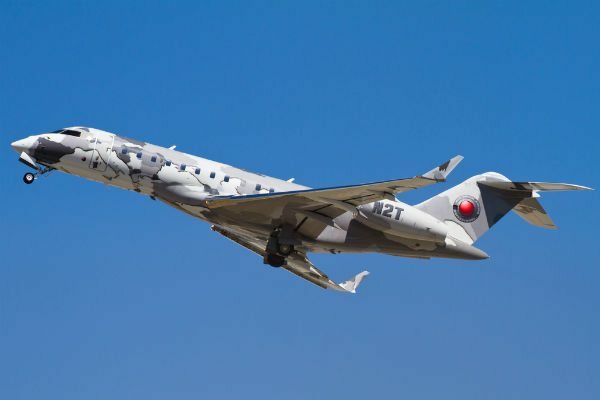 They like to stand out from the crowd and let you know exactly who they are, so below we’ll take a look at some of the more colourful business jets around. Nike’s Gulfstream G550 business jet (Photo: Russell Hill). At the top of any list – and worthy of a special mention – has to be the Nike flight department, who manage aircraft on behalf of co-owner Phil Knight, as well as Nike themselves. Nike’s most recent acquisition was a Gulfstream G550 (msn 5121), which was purchased from The Prem Rawat Foundation earlier in 2013. Gulfstream at Long Beach completed the very distinctive paint job, customising the aircraft with a Nike ‘swoosh’ on the tail and the soles of training shoes painted underneath the wings. But the personalisation doesn’t end there, as the tail number (N1972N) contains the year that Nike was first incorporated. A highly-personalised Gulfstream G650 owned by Phil Knight, co-owner of Nike (Photo: Russell Hill). 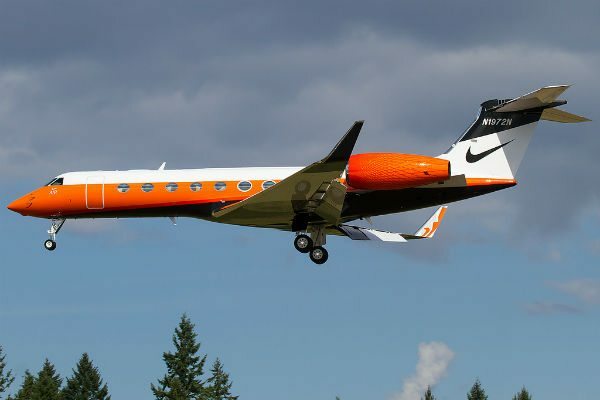 Nike’s earlier acquisition this year was a brand new Gulfstream G650 (msn 6024), although the Nike flight department operate this on behalf of co-owner Phil Knight. This distinctive scheme is different on either side of the aircraft, with one side showing a pictorial representation of Nike, the Greek Goddess of Victory, and the opposite side being a stylisation of the Oregon Ducks college football team’s helmet. The undersides of the wings have been painted with feathers, and each of the wingtips is painted with the signature Nike ‘swoosh’, but the ultimate customisation has to be the tail number: N1KE. Prada’s Gulfstream G450 business jet (Photo: Antony Pratt). 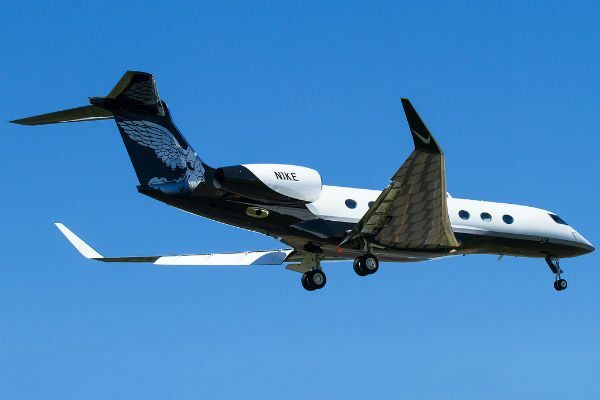 Prada are synonymous with the colour black, so it came as no surprise when a Gulfstream G450 business jet (msn 4279 / I-XPRA) was delivered to the company in a gorgeous overall matt black scheme. My personal favourite of all of the schemes here stands out wherever the aircraft flies. 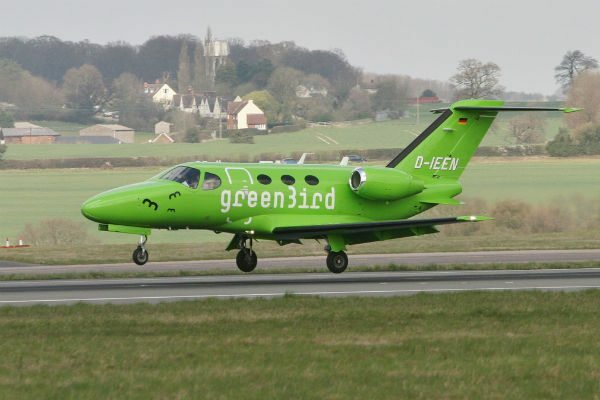 A Cessna Citation Mustang with a striking lime-green paint scheme (Photo: John Lythgoe). Another aircraft painted the same colour all over is this Cessna Citation Mustang (msn 510-0262 / D-IEEN), although the aircraft now been sold in France as F-HPHD and repainted. Is this a great scheme? Hard to say, but it certainly stood out. A Gulfstream G550 owned and operated by Sirio SpA (Photo: Bob Holland). With Italy known for fashion and style it shouldn’t come as much of a surprise to see another Italian registered aircraft making the list. 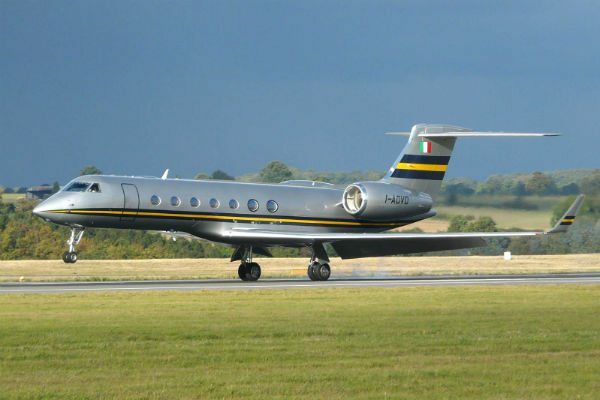 Sirio SpA took delivery of a Gulfstream G550 (msn 5314 / I-ADVD) during the summer of 2011 and its distinctive overall silver colour stylishly matched with yellow and black stripes has been brightening up airports in Europe and the rest of the world ever since. 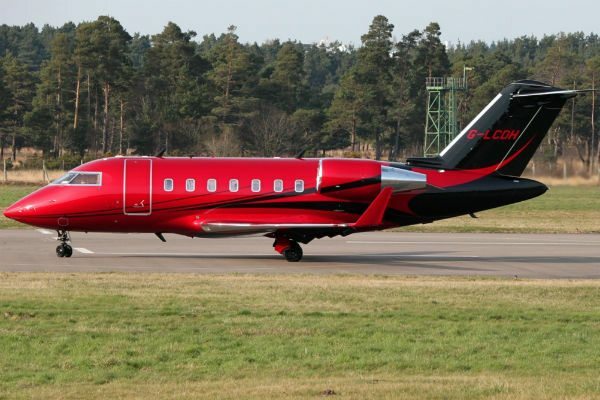 A Challenger 605 private jet owned by Lewis Hamilton (Photo: Trevor Warne). One person that clearly doesn’t mind standing out from the rest is Formula One racing driver Lewis Hamilton, who took delivery of a Bombardier Challenger 605 private jet in January 2013. With its overall red and black colours the aircraft (registered as msn 5904 / G-LCDH) also carries a personalised tail number, with G-LCDH representing Lewis Carl Davidson Hamilton. A Dassault Falcon 7X owned by Bank of America (Photo: Bill Robertson). 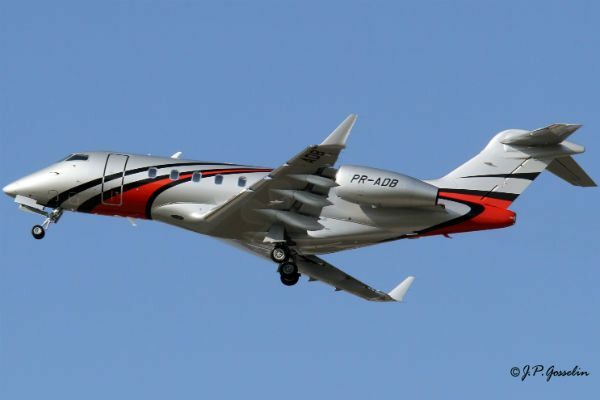 The first of two Brazilian-registered aircraft to make the list is a Dassault Falcon 7X (msn 162 / PP-RFA). 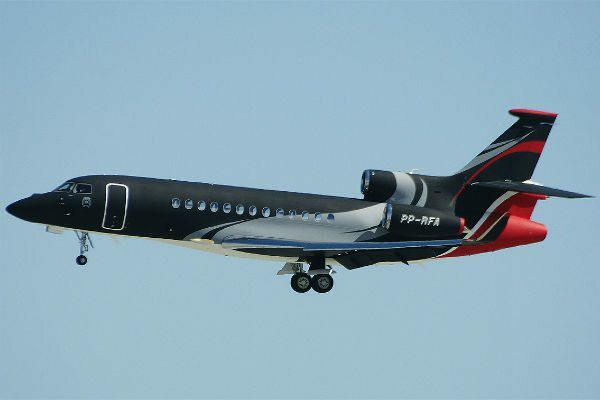 Delivered to the Bank of America in August 2012 and leased to a Brazilian holding company early in 2013, this Falcon 7X wears a stylish mix of black, silver and red that makes it stand out from the usual white schemes with pinstripes. A Global Express business with a camouflage paint scheme (Photo: Evan Baker). 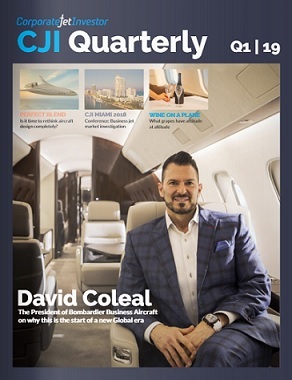 Oakley’s Bombardier Global Express (msn 9162 / N2T) takes the theme of blending into the background one step further, by adding what on first glance seems to be an overall camouflage scheme. Look closer though and you’ll see it’s a pictorial representation of a map, albeit with continents moved around to fit the aircraft. A Brazilian-registered Challenger 300 (Photo: J.P. Gosselin). Captured departing Montreal on its delivery flight, this Brazilian Challenger 300 (msn 20325 / PR-ADB) takes the theme of using black, red and silver together in a scheme, but swaps the usual order by using silver as the predominant colour. The addition of the red and black flashes make this Challenger 300 really stand out. 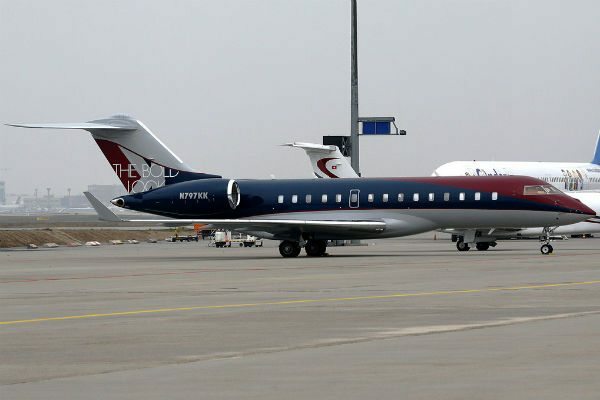 A Bombardier Global Express business jet painted in a multi-coloured scheme (Photo: Axel J). The Kohler Company, based in Sheboygan, Wisconsin, is best known for manufacturing plumbing products, but in business aviation it is known for operating a Bombardier Global Express (XRS msn 9290 / N797KK) in a gorgeous scheme that stylishly mixes red, black and silver and includes the company strap line ‘The Bold Look’ painted on the tail. 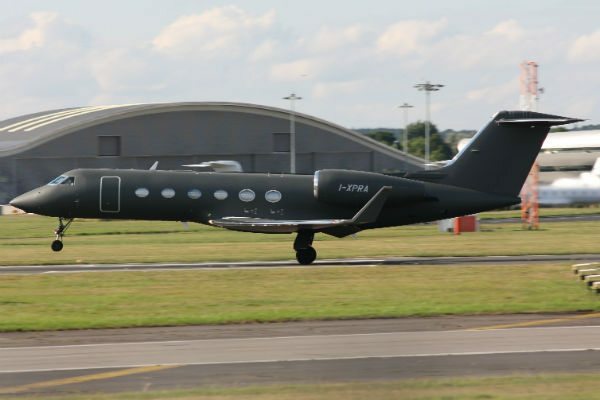 As well as the Global, Kohler also operates Gulfstream IVSP (msn 1429 / N777KK) in the same scheme. Disagree? We thought you might. If you think we have missed out a far better jet or totally disagree, please let us know and we will publish the best suggestions in a follow-up article. For more business aviation insights from Alud, we highly recommend checking-out the BizJetBlogger archive on Corporate Jet Investor.